This Thursday, October 7 at 10:00 a.m. Highway 56 from I-25 to Highway 287 will be renamed “Staff Sergeant Justin Bauer Memorial Highway” after the fallen soldier from Berthoud. Bauer’s memorial was sponsored by State Senator Kevin Lundberg, R-Berthoud, State Representative B.J. Nikkel, R-Loveland, and State Representative John Kefalas, D-Fort Collins. “Justin was an excellent soldier, and we will never be able to fully express our gratitude for the sacrifice he and so many others have made,” said Senator Lundberg. A brief ceremony will be hosted by the Colorado Department of Transportation on Highway 56 just east of Highway 287. Bauer’s widow, Kari, will be joined by State Senator Kevin Lundberg and other dignitaries to honor Bauer’s memory. Justin Lynn Bauer was born August 22, 1984, in Berthoud Colorado. He attended Berthoud High School where he was known for his exceptional athleticism and leadership skills. After graduating in 2002, Bauer joined the Berthoud Fire Department, and soon after worked at a scientific research station in Antarctica. In 2004, he enlisted in the United States Army, and served as a paratrooper in the 82nd Airborne Division. 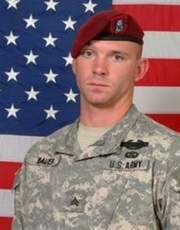 Bauer was on his second tour of duty in Iraq on January 10, 2009, when an improvised explosive device hit his vehicle and took his life. Bauer was an honorable soldier, being awarded with the Bronze Star, the Purple Heart, the Combat Infantryman Badge, and Army Commendation Medal. He was a respected leader and a loving husband, son, brother, and friend. He will never be forgotten by those who loved him, and now with the newly named “Staff Sergeant Justin Bauer Memorial Highway”, he will always be remembered for his service to this country.